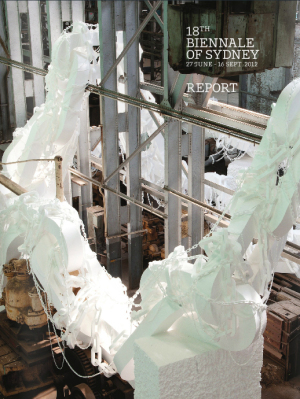 18th Biennale of Sydney (2012) Exhibition Report online on ISSUU. For the first time in the Biennale of Sydney’s 39-year history, the exhibition was developed by a curatorial duo, Artistic Directors Catherine de Zegher and Gerald McMaster. The 18th Biennale of Sydney was presented at the Art Gallery of New South Wales; the newly redeveloped Museum of Contemporary Art Australia; World Heritage-listed former shipyard and prison, Cockatoo Island; and Pier 2/3 in Walsh Bay. Redfern-based arts institution Carriageworks was a presenting partner for the first time. Read the report online on ISSUU.